One picture is worth...well...in this case a friendship for life! 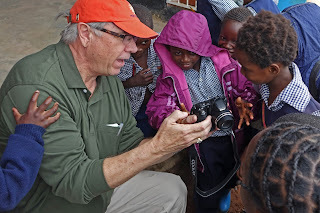 Mike Keeble, HEC board member, patiently demonstrates the wonders of a digital camera to an admiring audience. Mike diligently handles multi-million dollar budgets on his day job at the KUMC and gives the same quality time and attention to the kids in Zambia. But I bet he isn't as big of a Rock Star at the Med Center as he is with the kids!